Managing Procurement Performance is of course a critical process in any best in class organisation. Dashboard is a very interesting component of this process as its a graphical and easy to read document where key indicators are tracked. The NHS Procurement Dashboard is a tool developed to improve transparency and understanding of the procurement performance of NHS healthcare provider organisations. 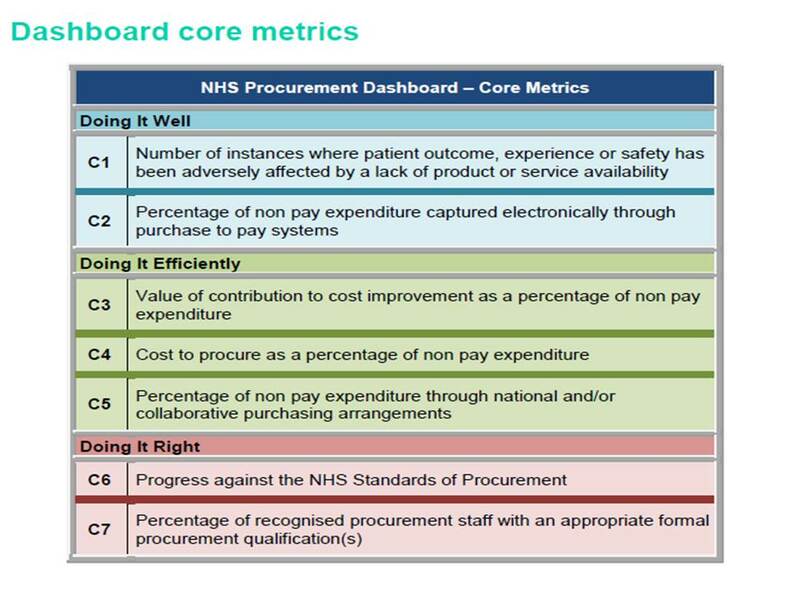 The NHS Procurement Dashboard provides a balanced scorecard of core metrics focussed on three key areas of procurement performance, namely, enabling business continuity, procurement efficiency, and mitigating risk. It will support internal governance and continual improvement in procurement performance of the organisation, external reporting, transparency and the identification of good and best practice. The NHS Procurement Dashboard has been developed through an extensive process of consultation, dialogue and pilot testing with representatives from procurement, finance and senior management levels in NHS provider organisations, supplemented by input from professional associations and experts in the field of procurement. While the core metric set has been developed for NHS provider organisations, many of the metrics address fundamental aspects of procurement practice and performance and could be applied to the procurement of any organisation.